Mary's song is so saturated in anticipatory empowerment that it cannot help but be more than merely anticipatory. Mary has just received the news that she will give birth to the Messiah, she takes that to mean that a whole new reality is invading her current situation, and her response is one which celebrates the immanence of this reality with such potency that she takes it to also be a contemporary claim. It is not the kind of waiting which sits back and simply kills time, comfortable on the warm couch of the current circumstances until something actually happens. No! Her anticipation takes the promise as an actuality, contemporary to what she is experiencing in her present. The future has truly broken into the present, so much so that it becomes a truth claim which bears upon present reality. In other words, for Mary, this claim for the future becomes the truest thing about the present. She cannot be comfortable with the world as she knows it. The powers that be and the economic systems of the world are held subject, even now, to the promise which God has for the future. "He has brought down rulers from their thrones but has lifted up the humble. He has filled the hungry with good things but has sent the rich away empty." She is empowered to wait, but not merely to wait. She is empowered by the future promise challenge the presuppositions of the world of the present. And she does challenge these powers, defying them to the end, evading them to the birth of her illegal child. Jurgen Moltmann should be, perhaps, our favorite theologian as we celebrate and anticipate in the advent season. He articulates the tension of the present reality with the future and in-breaking reality with some eloquence. He accurately describes this anticipation as "hope." In hope, we cannot be comfortable or complacent in the world as it is. "Hope's statements of promise...must stand in contradiction to the reality which can at present be experienced. They do not result from experiences, but are the condition for the possibility of new experiences" (Theology of Hope, 18). He later writes, "Those who hope in Christ can no longer put up with reality as it is, but begin to suffer under it, to contradict it" (21). And finally, "Hope alone is to be called 'realistic', because it alone takes seriously the possibilities with which all reality is fraught. It does not take things as they happen to stand or to lie, but as progressing, moving things with possibilities of change" (25). David Bosch has articulated this too. Discussing the mission of the church, he writes, "...mission is, quite simply, the participation of Christians in the liberating mission of Jesus, wagering on a future that verifiable experience seems to belie" (Transforming Mission, 532). Our anticipation is not merely eschatological, its weight of importance is not relegated solely to the future, but it is an eschatological imagination which is catalytic to the empowerment of people to the mission of God in the world here and now. We are "wagering" in the present on a future for which we wait, of which we can only be a foretaste. Active anticipation is being grasped by hope, made slave to it, so that our present reality is made subject to the profound hope in the promise of God-with-us. What is it, exactly, that we are waiting for? We are waiting for a new reality, one which has broken into the present in the incarnation of God in Jesus Christ in such a way that it bears upon the present, redefining human ontology and the direction of history as we know it. Jesus Christ is the present future, the future dwelling among us in the present, revealing God in our midst and revealing the true humanity. We are anticipating the historical (simply meaning authentic to actual human experience) validation of the promise which God has already spoken over us, the promise which challenges and disarms all other systemic and political claims on reality. So that for which we wait, namely Jesus Christ The Lord, is also that for which we live, here and now, calling the world as we know it into alignment with the world that is to come. Is that not what Mary is up to, even before the child in her whom is born into history? Mary, indeed, becomes our model for the active anticipation which characterizes the Advent season. 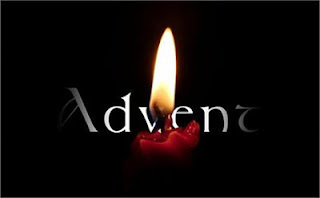 Advent is at its core a revolutionary season, and not just in the cliched sense of the word. Its radical implications for the world as we know it are to be proclaimed and lived out in the present, even as we wait in holy anticipation. Advent is about being possessed by this hope, and with the excitement of anticipation, declaring that the future which is coming far exceeds that which has been. The baby in Mary's womb has brought something radically and wonderfully new. We cannot help but be changed by it! May Advent find expression in us this season--expression in generosity, in hospitality, in sacrifice, in grace, and ultimately in love.